In 1974, Ron worked with Lennon on his Walls and Bridges album. 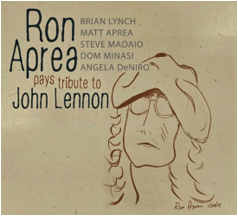 Ron now pays a long-overdue tribute to the musical genius of John Lennon. On Lennon's Walls and Bridges album, John used 5 horns, dubbing them "Little Big Horns." Ron's tribute also includes a horn section, along with a string ensemble, and added guest soloists. The guest artists include trumpeter extraordinaire Brian Lynch, virtuoso violinist Matt Aprea, jazz guitar veteran Dom Minasi, and a cameo performance by jazz vocalist Angela DeNiro. Another special guest is trumpeter Steve Madaio, a fitting addition to this album, as Steve was also a member of the Walls and Bridges' Little Big Horns. This collaboration is a mystical moment on this tribute, as Steve and Ron reunite in a heart-felt tribute to their former bandleader, with a stunning rendition of Lennon's "Imagine".